Charity: Water’s CEO, Scott Harrison, knew he was taking a risk with his nonprofit’s fundraiser gala plans. He knew he was, “either going to look very stupid in front of 400 people or maybe make them cry” as he admitted in an interview (Fast Company). When searching for how to run a fundraiser gala, a lot of answers will point to how to organize it all and how to ensure you feed your guests (which is no doubt important). However, Charity: Water’s example highlights the need to take a chance and think outside the box. According to an article featured in Fast Company, the gala took place in a glass atrium at Temple of Dendur, which was filled with a candlelit glow. At each table was a locked iPad on which a photo and name of a resident from Adi Etot, Ethiopia was displayed – each guest having their own individual from the community. After dinner, Harrison got on stage to talk about their work and to show a video of life in Adi Etot. Then he instructed attendees to type in the iPad password, “together,” which unlocked more photos of the person they had seen on the lock screen. Once a person donated the suggested $30, the screen above the stage showed the person’s grayed out photo become colored. This was the first way they highlighted the impact each individual donor has. But Harrison was just getting started. The screen then changed to live footage of Adi Etot, featuring the people the gala’s guests had just seen on their iPads. They were surrounding a drill. Suddenly, the geyser of water was activated, spreading water over all of the people there. Everyone was cheering – those in Adi Etot and those at the gala. Many of them, including Harrison, had tears streaming down their face. It worked. By the end of the night they had raised nearly $3.2 million. What can your nonprofit learn from this for your next gala? With a gala, you have an opportunity to show them where their dollar goes, through a full on experience. How can you establish trust for your gala attendees? Is it simply by producing a fancy dinner and showing them a video that pulls on their heartstrings? As Charity: Water’s example shows, it’s about more than that. Showing them exactly who their dollar impacts and how direct this is is what engages them. Yes, it takes time to go through your attendees list and try to match them with someone of a similar background or identity, but this helped Charity: Water stir up empathy in their audience. When your event attendees can realize they have the power to make an impact on someone they can relate to, it’s more likely they’ll recognize how important that is. 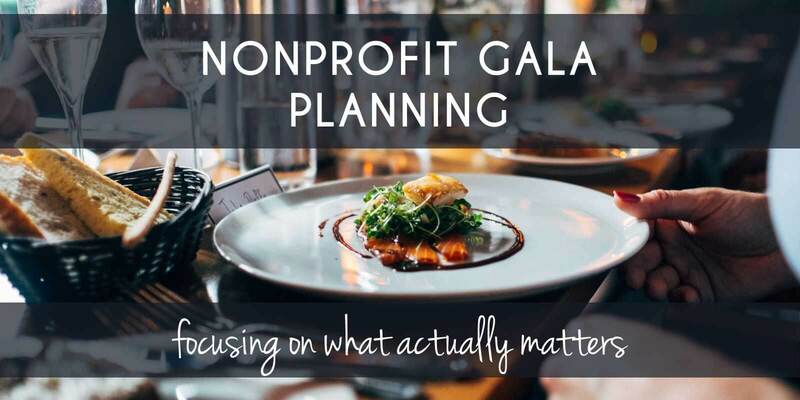 Maybe you don’t have the funds to transport your team to the places your nonprofit impacts, but if you can somehow show the communities and situations you impact, focus on that through your gala. The point where Charity: Water switched the footage from a recorded video to the live stream of the launch of the well was what changed the momentum of the evening. In that moment, the attendees were present with the people of Adi Etot. ⟵Where should all nonprofit website or marketing projects start?